(Phys.org)—When exposed to a varying magnetic field, some conductive materials undergo a temperature increase of about 3-5 K over several minutes. This effect is called induction heating, and it occurs because small electric currents cause heating due to resistance. Now in a new study, scientists have found that, under the same conditions, the temperature of a certain magnetic material increases by more than 20 K in less than a minute—and then abruptly stops and does not increase any further. The large, self-regulated heating power occurs at just the right temperature to potentially enable it to be used as a safe and effective form of hyperthermia treatment of cancer cells. 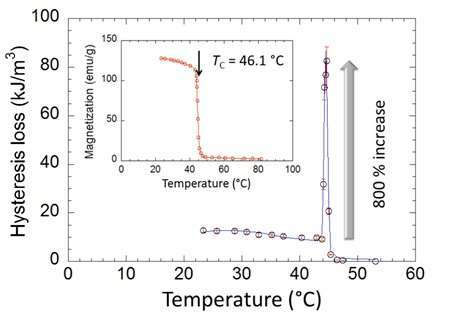 The researchers, led by Professor Kiyonori Suzuki at Monash University, Australia, and Professor Karl G. Sandeman at CUNY-Brooklyn College, US, and Imperial College London, UK, have published their paper on the extraordinary heating effect of the magnetic material in a recent issue of Applied Physics Letters. The material, La-Fe-Si-H, is a well-known magnetocaloric material, meaning it heats up when exposed to a magnetic field. La-Fe-Si-H is also ferromagnetic at room temperature, so that its magnetic dipoles align with an applied magnetic field and remain aligned even when the magnetic field is removed. This magnetic retention is an example of hysteresis, an effect in which the present state of a system is influenced by its past states. 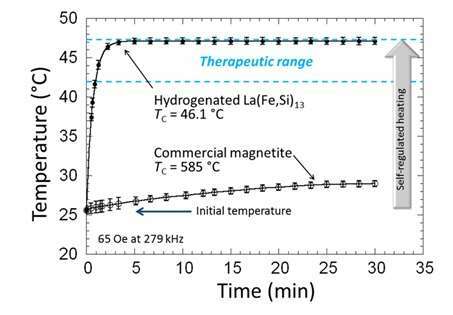 The scientists explain that the large heating power of La-Fe-Si-H is primarily due to the presence of thermomagnetic hysteresis near its Curie temperature. However, the most significant property of the material is arguably not its large heating power, but its abrupt change in heating power, which is unmatched by any material of its kind. The large heating effect stops just short of the temperatures that could damage healthy cells. As the scientists explain, the abrupt change in heating occurs because of the way that the material's magnetic behavior changes as its temperature increases. The large hysteresis in La-Fe-Si-H occurs only up to a few degrees below its Curie temperature, which for this material is 319 K (46 °C, 115 °F). This temperature, which is about 21 K above room temperature, lies in the ideal temperature range required for effective yet safe hyperthermia therapy. As its temperature approaches its Curie temperature, the material's magnetism begins to undergo a phase change from ferromagnetism to paramagnetism. A paramagnetic material has magnetism that is temporarily induced by an applied magnetic field, but, unlike a ferromagnetic material, it does not retain its magnetism when the field is removed. The phase change from ferromagnetism to paramagnetism in La-Fe-Si-H is somewhat unusual in that the two phases coexist for a few degrees just below 319 K. The most important effect of the phase coexistence in La-Fe-Si-H is that it causes a very large hysteresis loss, which is what leads to the extraordinary heating effect. However, when the temperature reaches 319 K, the material becomes fully paramagnetic. At this point, its large spontaneous magnetism and hysteresis loss abruptly drop to zero, as does the heating effect. The material stays at 319 K and physically cannot get any hotter. As the researchers explain, the phase coexistence is due to La-Fe-Si-H being a "first-order phase transition material." In contrast, in second-order phase transition materials, the two phases do not coexist, resulting in a much smaller heating power. The large heating power and its abrupt decrease at the Curie point make La-Fe-Si-H a promising candidate for cancer treatment based on hyperthermia. The material's heating power of 522 W/g demonstrated here is more than an order of magnitude larger than that of second-order phase transition ferromagnetic materials, and possibly the largest of any ferromagnetic material to date with a Curie temperature near human body temperature. It also approaches the recommended value of approximately 1 kW/g for hyperthermia treatment, and does so under nearly biocompatible conditions. The scientists also note that these heat effects have an interesting historical significance. Emil Warburg, a physicist in the late 1800s and early 1900s, is widely credited with discovering the heat dissipation associated with magnetic hysteresis. Although he was not the first to observe the magnetocaloric effect, many articles on the subject have incorrectly credited him with doing so. The new paper bridges these two areas. "In our study, we bring the research fields of magnetocaloric materials and hysteretic dissipation together, utilizing Warburg's hysteresis in the region of phase coexistence around the Curie temperature of a first order magnetocaloric material," Sandeman said.